Beach Wedding in a Tropical Paradise! Who said your wedding couldn't be a day at the beach. . . Tie the knot with your toes in the sand! 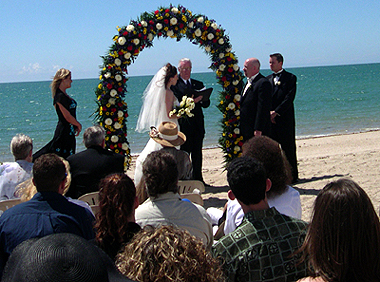 If the lure of a tropical paradise with an exotic "resort" feeling sounds good to you; if you desire a romantic, intimate ceremony on the beach with the sounds of the ocean, consider having your wedding ceremony in Puerto Peñasco (Rocky Point). Rocky Point is located on the Sea of Cortez in the State of Sonora, Mexico. 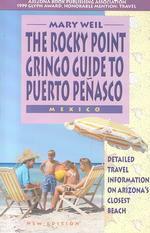 Rocky Point is famous for its clean beaches which are embraced by gold and pink sunsets and crimson dusks. Playa Bonita sweeps in a great golden arc from downtown to Oholla Bay and is the main beachfront for the town's resorts and condos. Its far end, Sandy Beach, has the best stretch of sand and sea. Los Conchas has many beachfront condos that can be rented (with all the comforts of home) for your wedding and reception. This gated beach community of beautiful, pristine beaches is a peaceful and relaxing seaside destination. 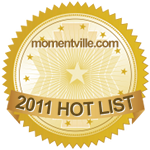 Away from the downtown noise and traffic, but a short 5 minute drive to fine restaurants and shopping. Planning to elope? Think about a beach wedding in Rocky Point. Make it as formal or as casual as you wish. Grab your sunglasses, beach blankets and sunscreen. Shorts and sandals anyone? Although wedding ceremonies performed in foreign countries are not legal ceremonies, a brief legal ceremony with witnesses can be arranged in your state prior to a ceremony in a foreign country. 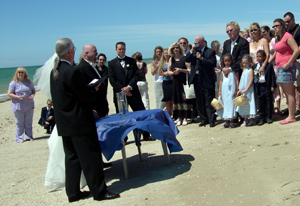 What better place than the beach to have a Blending of the Sands Ceremony. Larry James will travel anywhere your budget allows. 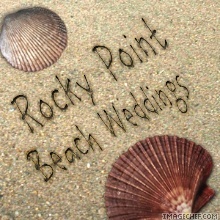 Call Larry for more details about planning a Rocky Point Wedding! Rocky Point experiences only 2 inches of rain a year so a dry wedding ceremony with plenty of sunshine is pretty much guaranteed. During the winter months the days are warm although the nights can get a bit chilly. The sun shines almost year round. For most of the year the days are warm and sunny. The water temperature is often above 80 degrees and there is almost always an ocean breeze to produce pleasant romantic evenings. (See average Rocky Point air and water temperatures below). Arizona's beachfront, Puerto Peñasco (Rocky Point) is just a 4 1/2 to 5 hour drive from Phoenix. From Scottsdale, it's about 260 miles. Currently, all you need is a government-issued photo ID, such as a driver's license, along with proof of citizenship, such as a birth certificate when crossing back into Arizona. Beginning June 1, 2009, a valid, unexpired passport is required to cross the border into and to return from Mexico by sea, air and land. Leave all time schedules and uptight attitudes at the border, when entering Mexico you will definitely want to relax and have a great time. When crossing the border from Arizona, chances are you will be stopped to be searched, don't worry they are just looking for people smuggling in American Products for sale, Drugs & for plants. Once you cross the border, look for 2 crucial turns in the town of Sonoyta, again don't worry just follow the signs that point to Puerto Peñasco. Why, AZ is a good place to top off the fuel tank before crossing into Mexico. Gas in Mexico is available in most locations but the quality can be inconsistant and not what you are used to stateside. At the end of Gila Bend you will see a Mc Donald's, right before the Mc Donald's turn on to the continuation of Hwy. 85 South (90 more minutes until the border). Follow Hwy. 85 straight through into Mexico. Continue South on 85 through Gila Bend, Ajo, Why and Lukeville, AZ. Lukeville is the last town before the Mexican Border. The settlement at Lukeville is called "Gringo Pass" and has all facilities available if there was anything you forgot, although stopping in Ajo is a better idea. When you cross the border, the first town will be Sonoita. You will have 2 turns to make into the town of Sonoyta. Just follow the signs overhead that point to Pto. Peñasco (that is Puerto Peñasco abbreviated). You now have roughly 60 more miles until you get there. About 2 miles from the border you will come to a three way intersection. Stay to the left (towards Caborca). Do not take the direction to San Luis. About 1 block south of there the road will split into a "Y". "Pharmacia San Luis" will be on your right just before the "Y". Stay to the right and you will be on the road to Rocky Point. You will pass "Vasquez's" on your left if you have made the correct turn. There is a traffic light soon after "Vasquez's" that is easy to miss if you don't know it is there. Continue along the same road all the way to Rocky Point. Watch your speed limit, the speed limit is only 20 mph. Watch for the signs and they will direct you to Mexico Route 8. Follow Route 8 straight through to Rocky Point. There are a few curves and also ranches where cattle roam free. We recommend you stay alert, watch your speed and drive only during the day. Take Valencia Road West and it will turn into Highway 86. Continue West on Highway 86 through Sells and Quijotoa (Papago Indian Reservation - Tohono O'Odham) and then to the town of Why, AZ. In Why, turn left onto State Highway 85 South. Follow Highway 85 South to Lukeville, AZ to the Mexico Border. See above directions from Phoenix for once you arrive at the Mexico border. For a map from Arizona to Rocky Point, click here or here! For another Rocky Point map with mileage from various cities, click here! NOTE: The Lukeville, AZ Port of Entry hours of operations are 6:00 a.m. to 12:00 a.m. PST. For current border crossing times, click here. For possible "travel delays" click here. It is strongly recommended that you obtain temporary Mexico auto insurance. It is not a requirement, but normal U.S. auto insurance is not valid in Mexico. Don't even think about buying Mexico Auto Insurance at the border. Why? Because you will save yourself some $$'s if you buy insurance before you leave. It is very easy to obtain Mexican auto insurance from AAA online (AZ residents only) or from one of the many insurance offices in your hometown. If you break down on the freeway in Mexico, and a bright forest green utility truck stops to see what is going on, that's good news, they are from the government and their job is to help all motorists in distress. Do not exceed the speed limit in Mexico. Remember not to drink the water out of the tap. Do not brush your teeth with tap water, use bottled water instead! Water is not treated by the same standards as in the United States, so you risk intestinal infection. Most restaurants use ice made from bottled water, but it's a good idea to ask your server before you order a margarita or other iced drink. Bring lots of bottled water with you. If you do get sick, there is medication over the counter in Mexico. (Make sure you consult your doctor on that one). There are ATM's around town, but they will likely distribute pesos. We recommend you use U.S. ATM machines before you get to Rocky Point. There are grocery stores throughout the city. But don't expect to find an Albertsons or Costco anywhere. You can find 20 varieties of hot sauce, beer, soda, ice and some canned goods, with an offering equivalent to a gas station. There is no need for honeymooners to worry about exchanging their money into pesos; American money is widely accepted throughout Rocky Point. Some businesses accept credit cards and checks, be sure to ask first! However, if you want to know the conversion rate of your money, click the Currency Converter to the left or click here for another Dollars to Pesos Currency Converter. Leave your guns at home! In Mexico, possession of any firearm without proper authorization by the Mexican authorities is considered a "Firearms Offense" and carries stiff penalties. Possession of a single weapon carries a penalty of up to 5 years in a Mexican prison. Sentences for possession of firearms in Mexico can be as long as 30 years. U.S. Citizens should comply with all Mexican laws on arms or ammunition, including any arms they may wish to bring in for hunting. Remember you're in Mexico to have a fun time, so take off your watch, forget about the time (the locals have) and have a great time! What is needed for a Mexico marriage to be legal in the U.S.? The Hague Convention on the Celebration and Recognition of the Validity of Marriages (1978) obliges signatories to recognize marriages validly entered into in foreign countries, with certain reservations. The convention obliges signatories to legally recognize marriages certificates from any foreign country whose requirements have been met. The USA is not a signatory to the Hague convention. Theoretically this means that the USA is not obliged to recognize foreign marriages without adding additional legal or documentary requirements. In practice however, The US government recognizes all foreign marriages that are recognized by the country in which they took place, provided the parties to the marriage would also have been allowed to marry in the USA. If you have any doubts about this, contact the office of the Attorney General's office of the state in the United States where the parties to be married live. People under the age of 18 may not get married in Mexico without parental consent. With parental consent, boys have to be at least 16 and girls need to be at least 14 years of age. Foreigners are not subject to residency requirement, but will have to identify themselves by presenting their tourist cards and/or visas as well as a copy of their passports. In the case of two non-Mexicans, the civil marriage process is designed to eliminate undue delay. However, if one of the spouses is a Mexican national, permission must be given by the Secretaria de Gobernación; this request may require several months to be processed. At the time of entering into the civil marriage, the couple must declare that they are being married either: (a) with all goods and property in common (all goods held as "community property") or (b) under the regime of "separación de bienes" which means that each individual will maintain ownership of their pre-marriage property. If one or both individuals has previously been married to a person still living, then proof of a legal divorce must be provided. These must be certified under the "Apostille Protocol." Persons previously married must present proof of the termination of that marriage in the form of a divorce decree or death certificate. If the divorce or death took place outside of Mexico, it must be authenticated and translated into Spanish. Divorced people cannot marry in Mexico until one year after the termination of the divorce. If either party is widowed, the death certificate of the deceased spouse will be needed as part of the documentation requirements. Witnesses - You will need to have 4 witnesses present at the legal ceremony, and they must have valid identification. Validity Outside of Mexico - Your Marriage Certificate will be valid worldwide, but you should get your certificate legalized in Mexico to ensure it is legally accepted when you get back home. In Mexico, a civil marriage is valid for legal purposes worldwide, however, a spiritual wedding without first being married in a civil ceremony is not. Before a couple may be married by the Church they must have been married under civil law by a judge or justice of the peace. It does not matter whether the civil ceremony is performed in Mexico or in some other country, but proof of the marriage must be presented. NOTE: There are many more legalities, such as paperwork, blood tests no more than 14 days before wedding date (approximately $100 USD per couple), etc., plus birth certificates apostilized by the Mexican consulate in your home country must be sent preferably 3 months before the wedding. In Mexico, church weddings do not change your marital status, so you will need to get married by a Justice of the Peace before your church wedding. The marriage requirements above are for two foreign citizens. If one of the people to be married is a Mexican citizen, the process is lengthy and you will need to present your papers to the Instituto Nacional de Migración in advance. NOTE: Because of the legalities of Mexico law, to simplify the process of getting married there, remember, a wedding ceremony performed by a United States minister/officiant in Mexico is not a legal ceremony, however, a brief legal ceremony (usually about five minutes + signing the marriage license) with witnesses can be arranged anywhere in the Greater Phoenix area (or Arizona) prior to a ceremony and celebration in Mexico. That way your wedding will cost you less, be legal in the U.S., less time consuming and stress-free! Click here to estimate Larry's fee for a Rocky Point wedding or renewal of vows ceremony on the beach! Call for all the details: 480-205-3694. Rocky Point 911 - Know your options in case of an emergency or accident while in Rocky Point. Click here! You may want to print this page and take it with you. Suzy & Scott Steinmann's Sunset Commitment Ceremony in Rocky Point - Visit the Steinmann Photo Gallery! Larry's Favorite Rocky Point Restaurant: - Hacienda Las Fuentes - They are located on Blvd Fremont (the road to Las Conchas), four blocks east of Benito Juarez Blvd (the main street in town) on the corner of Blvd Freemont and Sinaloa. They have a great menu, tasty drinks, excellent service and the ambiance is unmatched in Rocky Point! It's also a great place to have your rehearsal dinner! The Rocky Point Gringo Guide: A Travel Guide to Puerto Penasco, Mexico - Mary Weil - Includes information on entertainment, beaches and hotels and Spanish phrases. Covers all the basics with a touch of humor. Where to eat, stay, visit, how to get there and how to get back. Considered an essential book for a first-time visitor. To purchase this book, click on the book title! www.MomentsInFilm.com - Jacquelyn Phillips, specializing in Rocky Point beach weddings, documentary, fine art and candid photogrphy, and is available for travel and affordable. My friend, Todd Bristol has an Ocean Front Condo in Rocky point and you can rent it for your wedding or just a week-end get-a-way. Click here. Romantic Ocean View Condo in Rocky Point at Bella Sirena. Call Jeanne Greer @ 602-206-9784 for details. Many brides these days are opting for beach weddings. 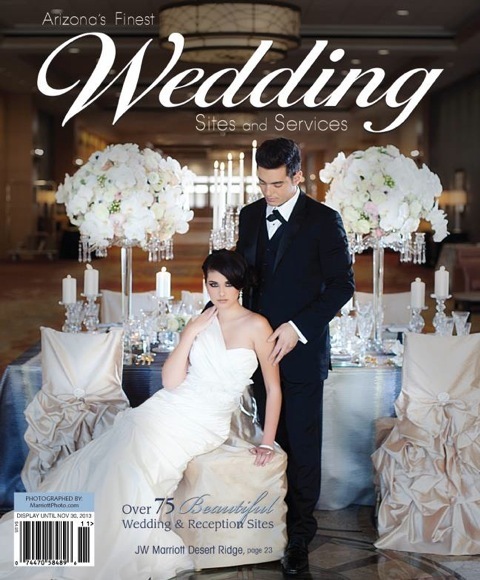 Click here for links to articles about "Beach Weddings." For a list of "Preferred Vendors" who love to work in Rocky Point, click here!